NEW DELHI: India was first off the bat to welcome the results of the presidential election in the Maldives, which threw up yet another surprise as the incumbent president Abdulla Yameen lost to a unified opposition candidate, Ibrahim Solih. With only early provisional results in, the foreign office said in an early morning statement that said, “We heartily congratulate Ibrahim Mohamed Solih on his victory and hope that the Election Commission will officially confirm the result at the earliest.” After two years of tetchy relations between India and its Indian ocean neighbour, the elections have opened a new chapter in bilateral ties. According to the final tally put out by the Maldives Election Commission, Ibu Solih got 134616 votes compared to Abdulla Yameen who got 96132 votes, out of a total of 230748 votes cast. Yameen got 41.7 per cent of the vote, well behind Solih on 58.3 per cent. Over 89 per cent of eligible voters came out to vote, even waiting hours to cast their vote. India was quickly followed by Sri Lanka and US in welcoming the election and the results. The action was more to remind Yameen that the world stood behind the process and its outcome than anything else. The elections surprised people yet again since it had become virtually accepted wisdom that Abdulla Yameen would be using the elections to merely consolidate his already overwhelming power. In the past year, Yameen has not only thumbed his nose at India but was well on his way to becoming a security threat for New Delhi, by allying too closely with Beijing. Given Maldives’ strategic location in the Indian Ocean, India had been feeling the heat for some time. Sources in Male said Yameen invited the president-elect to the presidential palace after conceding defeat, although the final results will take a week. The inauguration of the new president will take place in November after Yameen’s term ends on November 17. The Maldives ambassador to India, Ahmed Mohamed said to TOI, “History has proved that although we may be accused of all sorts of things, we do practice democracy, irrespective of what the results may be. President Maumoon Abdul Gayoom ruled for 30 years, but it was he who opened Maldives to elections and multi-party rule.” Mohamed, who is close to outgoing president Yameen, said he would go back to join the opposition in his country. 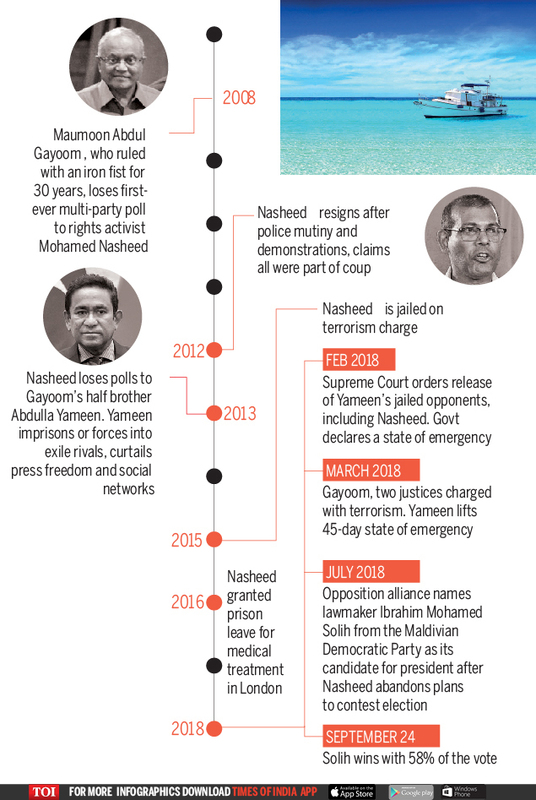 India played a waiting game since February 5, when Yameen upended the judicial system by jailing Supreme court judges, which he followed in the following weeks by throwing into prison almost all other political leaders, including his half-brother and former president Maumoon Abdul Gayoom. At times, India seemed almost ineffectual or helpless, as Yameen demanded that India remove its helicopters, cut visas for Indian workers etc. India’s non-kinetic approach to Maldives was offset by US and EU, both of whom threatened to put Maldives under sanctions if the election process was tampered with. A couple of things went against Yameen- his arbitrary style made him deeply unpopular though he did not start out that way. Second, the economy started to show strains. With tourism flows down as a consequence of a slew of travel advisories, the Yameen government’s room for manoeuvre was constrained. Second, a divided opposition would not have achieved success, particularly as most of their leaders were in jail. The fact that they were persuaded to come together to put up a unified single candidate, consolidated the anti-Yameen vote. 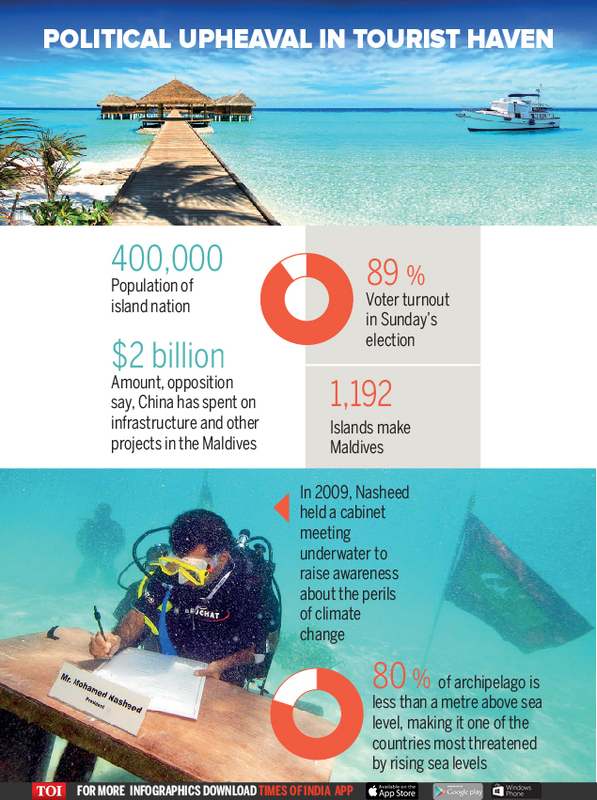 Yameen moved Maldives from its India moorings to assiduously courting China and Saudi Arabia. China built infrastructure, resorts and reports said, deepened its presence in at least seven of the important islands. Slowly, Yameen began to edge India out, which became a problem as India found China was trying to take over the southern atolls which are crucial for India’s Indian ocean security_ in particular, China was trying to take control of the one-and-half degree channel which would allow its submarines unimpeded access into the Indian ocean. Ibu Solih is likely to correct this tilt and be more accommodating of India’s security interests. He has already said he would remove the draconian defamation laws. But it would be foolish to believe that China would be out of the Maldives. With 70 per cent of Maldives’ external debt to China, and Maldives’continuing demand for infrastructure, China is not going anywhere, as has been seen in neighbouring Sri Lanka. What the elections have done is to put India back in the strategic game in Maldives. In the past eight months, India has come under pressure domestically to act against Maldives, either militarily or by squeezing the island country. No military option was on any table after the first 24 hours of the crisis breaking out. However, the Indian government also refused to repeat its experience of the 2015 blockade in Nepal, saying India would never “win” in Maldives, if the common people were put at risk. Maldives uses India for almost all its essential commodities and a blockade or anything like it would be terrible for the people. However, as the crisis unfolded and Maldives began to be seen as a security challenge, it was India that led the way in crafting the international response. Both US and EU looked to India to lead the way — but India played it very quiet, but urged them to take diplomatic steps against Maldives. That may have irritated them but it ensured that India was not a factor in the Maldives election campaign which could have gone against India. In the coming months, India will completely recast its approach to Maldives. Male will find India to be a generous neighbour again, with New Delhi moving quickly to recover lost ground in the island nation. South Block will get to work soon to set out a high-level visit before India’s own election season gets underway. Modi has not yet travelled to Maldives in four-and-half years. China would have been unpleasantly surprised by the outcome today. As in Pakistan and Sri Lanka, China prefers to deal with dictators and arbitrary rulers, by weaponizing its capital in the form of generous infrastructure projects and resultant debt, leading to greater Chinese control — that model came apart today. Again.